Exclusive: MI6 caught up with Young James Bond author Charlie Higson about his second novel Blood Fever. Speaking for the first time to a 007 website about the new book, Charlie Higson discussed his work on Blood Fever and the Young Bond series in this serialized MI6 interview. What was it like doing the research for this book, especially the locations? Ohhh, it was a terrible hardship going to Sardinia and staying in nice hotels! I hate doing research and I’ve always avoided it before, because I love just getting on and doing the writing. But from doing these books I have found that I’ve enjoyed doing the research a lot more than I thought. I’ve had to do a lot of research about Eton, the 1930’s and then specific locations for each book. The reason I chose Sardinia was that it was a place that I’d been to a couple of times and a place I thought was really fascinating. Also it’s an island that not many people know very much about. So I felt it wasn’t well-worn territory that had been gone over in a lot of other books and films. Starting it I did remember that “The Spy Who Loved Me” is supposed to be set partly in Sardinia, but you wouldn’t know if you weren’t paying attention. But it has got a fascinating history and its very different to everywhere else around in the Mediterranean. I’d seen a bit of the island, the main thing that inspired me was a picture I’d seen in a travel book of a cave. A hidden cave up in the mountains where a village was inside. There was an artist’s impression and it looked like a kind of Bond villain's lair. It has a lot of echo of the interior of the volcano lair in "You Only Live Twice" - the movie version. The fact that you’ve got these buildings inside a cave up a mountain was my sort of inspiration for the book. I thought fantastic that would be a great location. The more I read about Sardinia, about the history of the invasions, the bandits I thought "great!". So I wrote the bulk of the book in rough and them made a trip out there to specifically go to the location that I was using. Inevitably the actual cave that I went to visit wasn’t as exciting, romantic and dramatic as the artist’s impression, but it was still amazing and well worth visiting. So I had a fantastic weekend out there, I went out with Paul Whitehouse, the two of us went out because we were talking about some film work at the same time. I dragged him round all the sites in the book and we went to visit some of the monuments and weird old castles. We climbed up into the mountains and visited this cave; it was brilliant. It is a fascinating island and I hope to go back sometime. 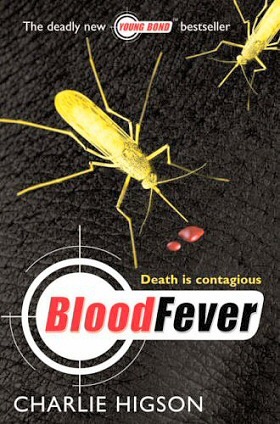 How did the process of creating Blood Fever different from creating Silverfin, was it easier the second time round the loop? Well I didn’t have to do so much on the actual working on the character and the specifics of the fleshing out the "You Only Live Twice" obituary. That was done I had the setup of the school and who he was, and the relationship with the aunt, and the whole framework. But every new book is a new challenge. In fact I think it took me quite a lot longer to write the second book because of the whole mechanics of the action sequences in Sardinia. I cut a huge amount, the story was structured slightly differently and was a lot more about Bond actually getting out to Sardinia. So just getting the story right in this one took a lot longer. But it was easier in terms of knowing who James was, what his setup was. Do you expect Bloodfever to sell more copies than Silverfin? I don't want to make any predictions, I mean the idea was always to write a sequence of books because particularly with kids books you build up a kind of snowball effect. The more you have coming out he more people buy. Its easier than having a one off book, so you know you always hope that the second one will sell more than the first one and the second more than the third. Over time hopefully they will keep selling. The indications are very good on the second book, the advance orders have been fantastic, and the bookshops and booksellers are very keen on it pleased with it. The proof of the pudding comes down to whether the kids like it or not. I hope they will. The second book has probably got more action and adventure and big scope that you expect from a Bond book. But that being said the kids like the way the first book worked so obviously I hope that it's going to sell a lot. The first one has done fantastically well and much better than I could have expected.